Last winter, I started to work on updating our hall bathroom, but stopped once we decided to add ‘built in’ IKEA shelves and a new TV on the wall to our family room. 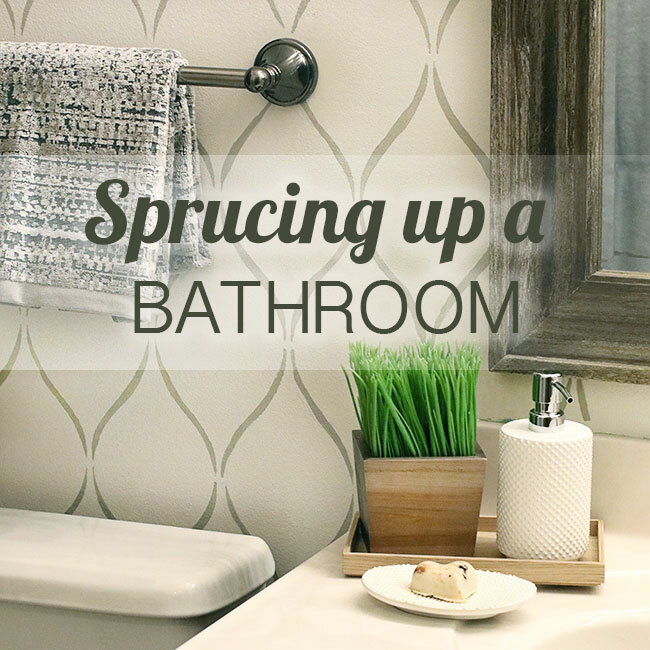 I still have a few things I need to do in our family room to finish it (lighting, coffee table and rug), but I’ve also been back to work at finishing our hall bathroom! Does anyone else work on multiple rooms in the house? I do and I drive myself crazy! 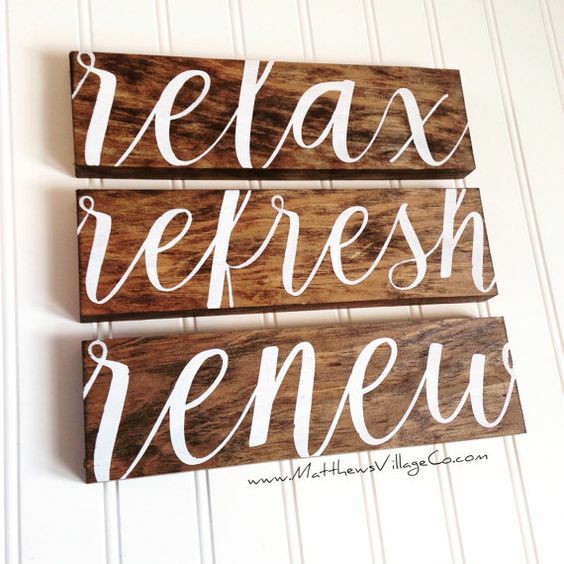 😉 I’m not sure if I could ever handle The One Room Challenge that some bloggers partake in! Amara came out recently with their SS17 collection and it is absolutely gorgeous! 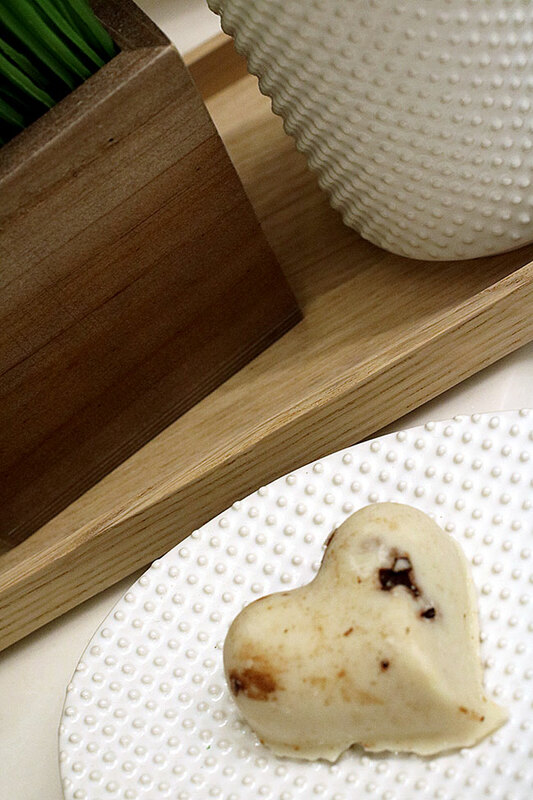 You can select from bathroom, kitchen/dining, home accessories/decor and more! 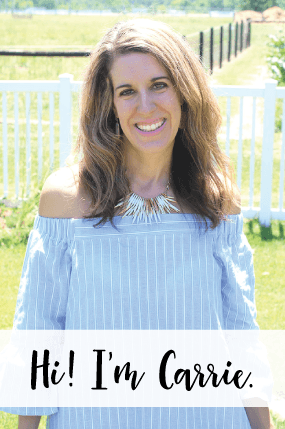 I have been wanting some new sink top accessories and towels for our bathroom and I had no problem finding the perfect items from their trendy, clean and affordable selection. 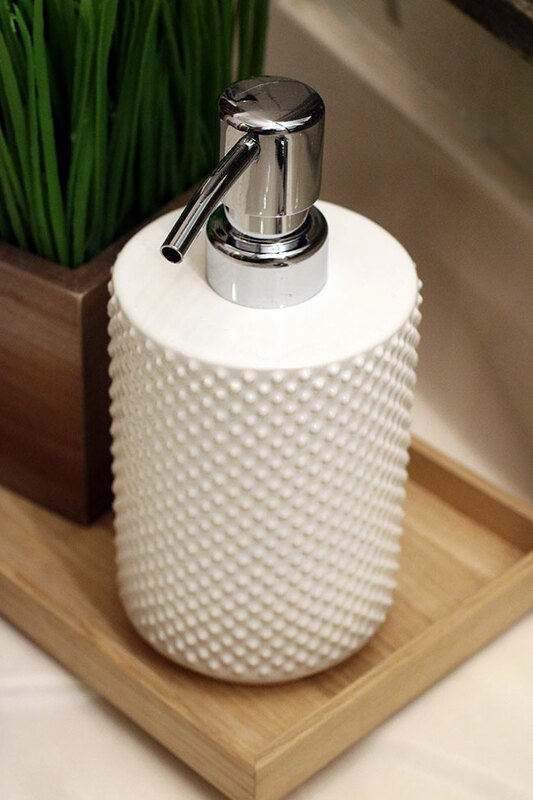 I wanted a new soap dispenser and dish for our vanity top, yet wanted something neutral and clean. 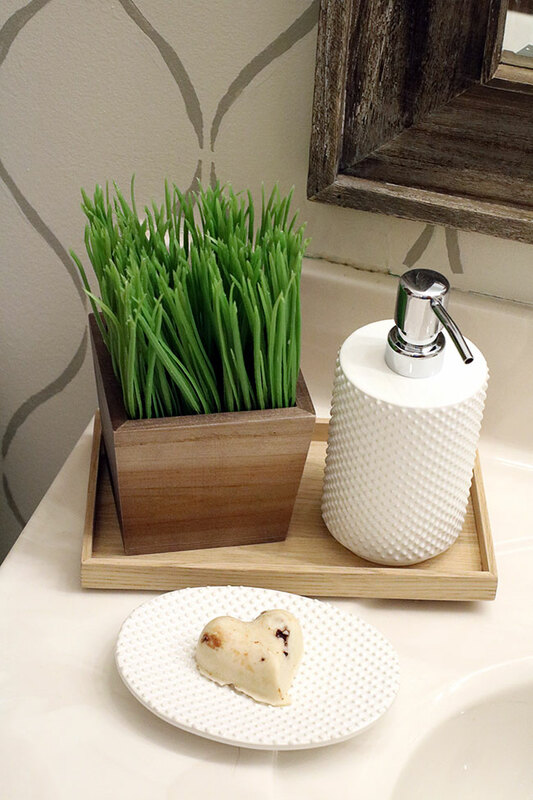 I selected this Nomad tray (made from untreated oak), Athena Soap Dispenser and Athena Soap Dish. When I saw the tray, I knew I had to have it! I also placed a pot of greenery to the tray to add a touch of the outdoors to the room. 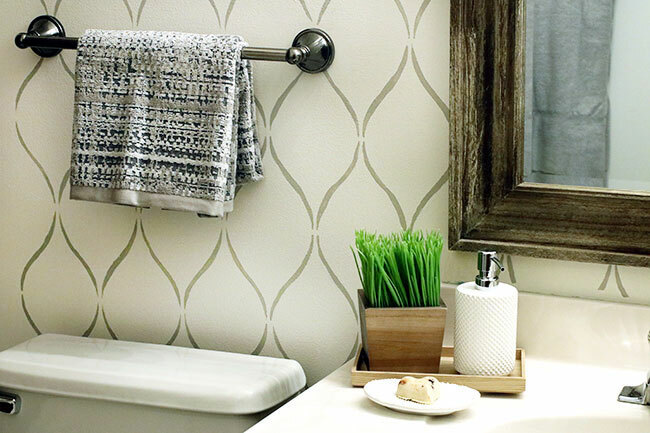 I always like to have some accent towels in my bathroom that I can mix and match with regular plain jane towels. 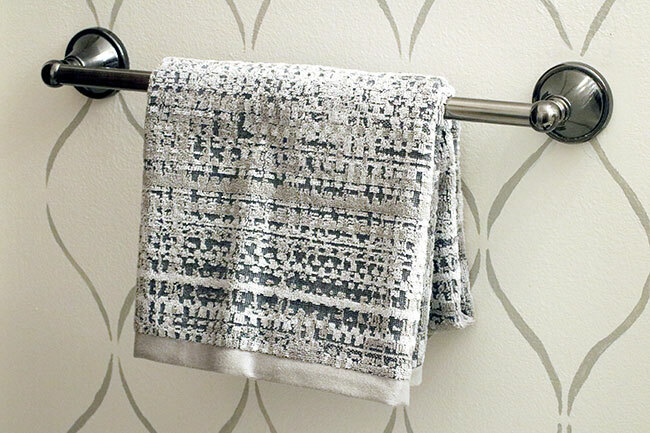 This Lark towel is so pretty with its soft gray tones and silver accents. 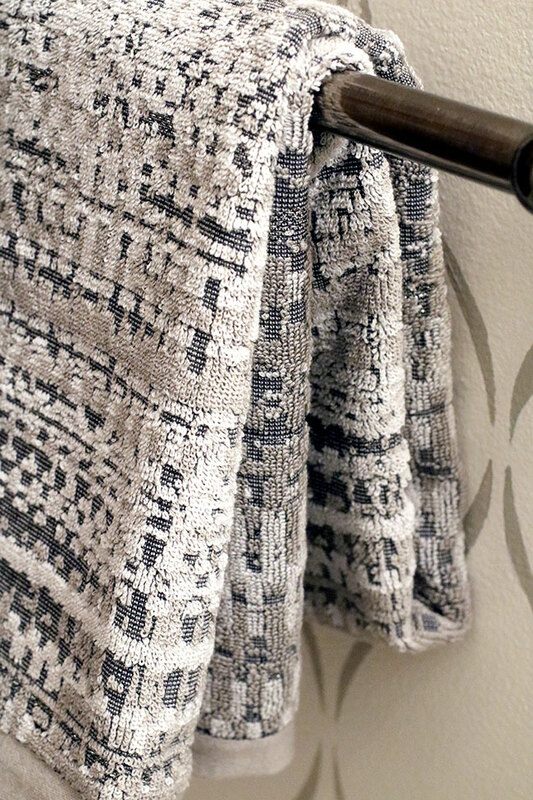 You can see a hint of the silver accents in the Lark towel in the photo above. 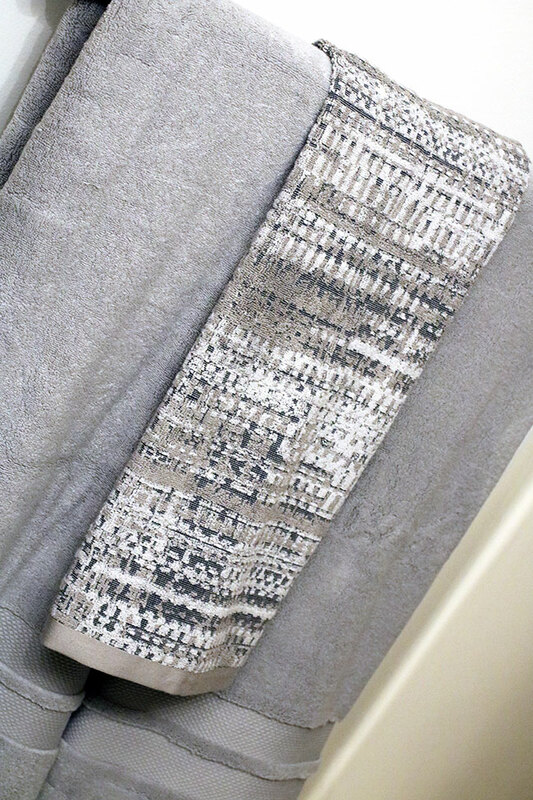 I was sent two of these towels and I layered one over two of the Super Soft Cotton bath towels (in silver). I’m planning on changing the towel racks around in this bathroom and I may even do individual hooks for the bath towels. But, for now they’re on a regular bath towel rack. I still have a lot of work that I need to do on the hall bathroom! So far we’ve painted the room, did an accent wall using a stencil, hung a new driftwood mirror and installed new lighting. I hope to work away on these items this summer! Brian will have to help me with some of them, such as installing a new faucet. 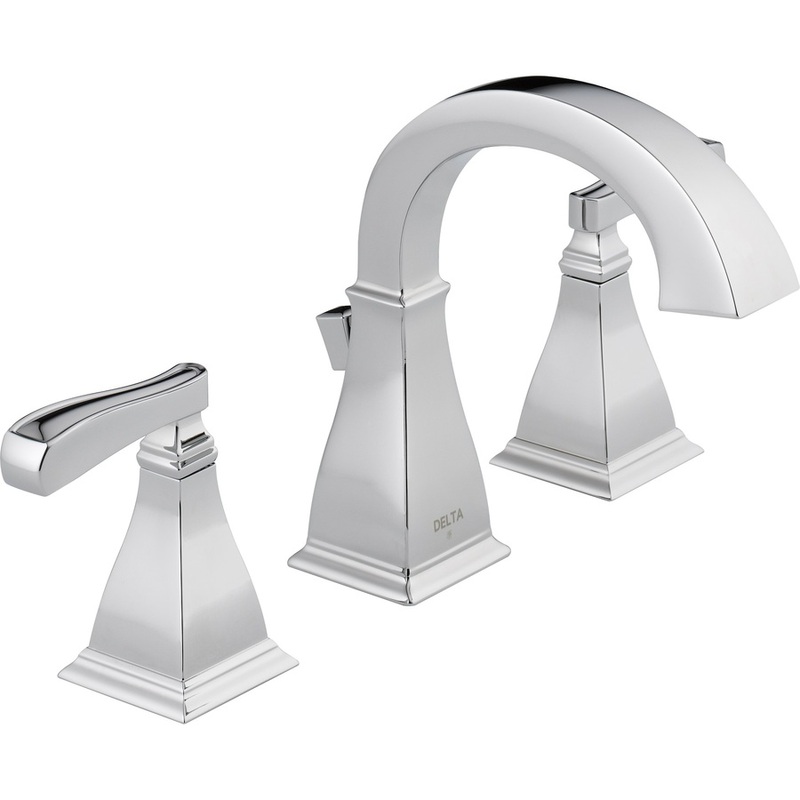 New Faucet, something similar to THIS one. 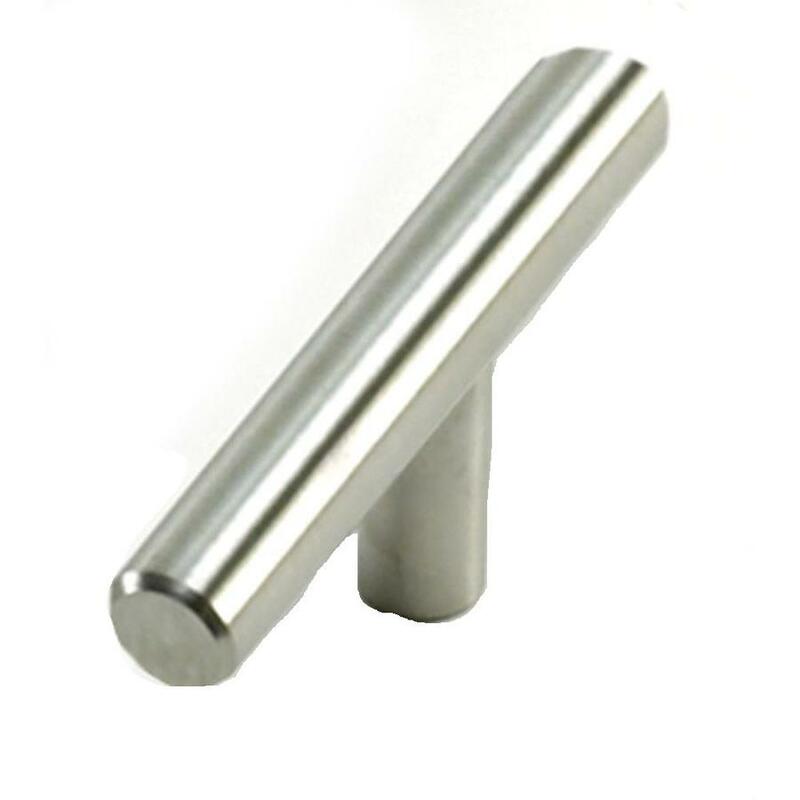 Paint Vanity/New Hardware on Vanity Doors like THIS or THIS. 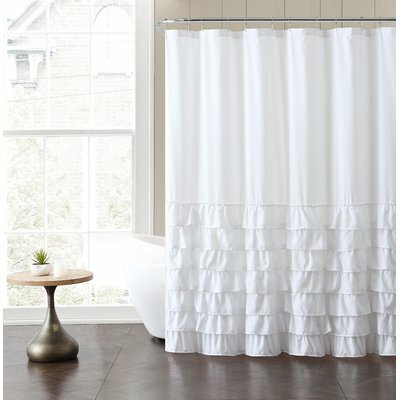 New Shower Curtain like THIS or THIS – I can’t decide if I like ruffles from top to bottom or just half of the curtain having ruffles. Which do you prefer? 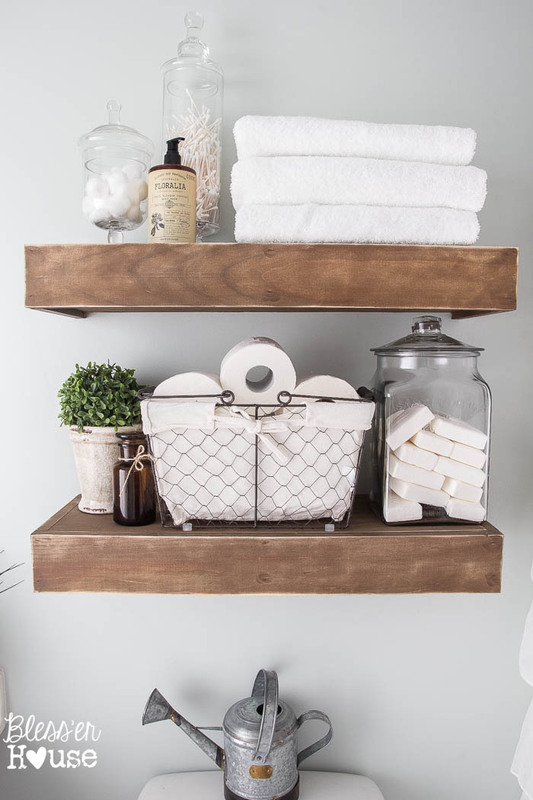 Floating Shelves Above Toilet – (photo from Bless’er Home) Would stain them a different color to match mirror, though. 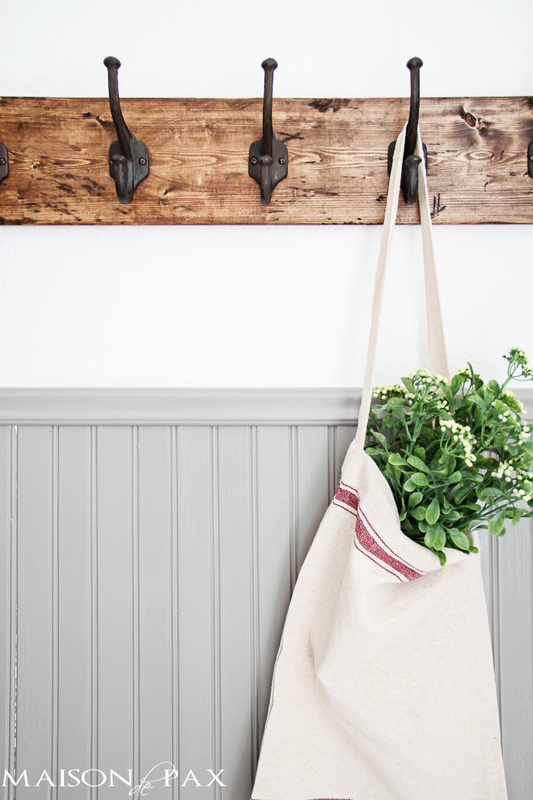 New Towel Racks/Different Placement – I really want our towels on individual hooks, like this one from Maison de Pax. Mirror or Picture Frame above Towel Rack, this is something I’ll purchase last after I see how the rest of the bathroom looks. I really like THIS one I found on Pinterest. 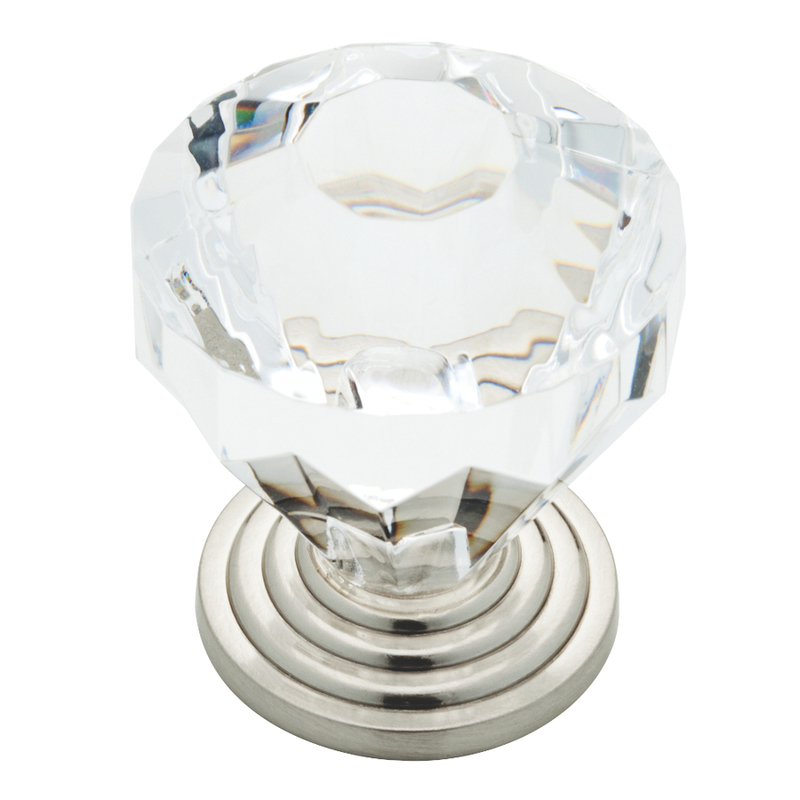 I’ve been so pleased with my new bathroom products from Amara. Be sure to stop by to visit their site and browse their new SS17 collection! 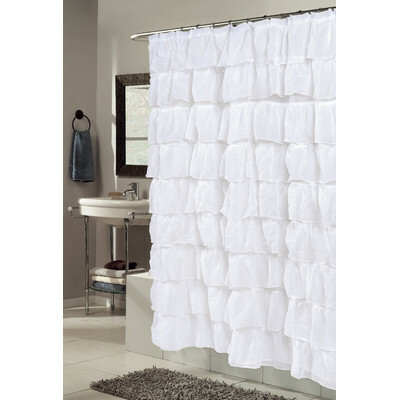 This post is sponsored by Amara.com, which provided me with beautiful bathroom accessories and towels in exchange for my honest product review.